So, back in March or so of this year I was shopping for a new jointer to replace an old 6” Delta / Rockwell that was bought and subsequently sold on CL. After using the 6” for a while and learning its capabilities and limitations, I decided I wanted a larger machine. Ultimately, I decided I wanted a 8” jointer with a helical cutter head, as I work a lot with figured maple. Up here in Canada, we don’t have the abundant selection of woodworking machinery that’s available in the States. I did some comparison shopping and decided to order from the US. A Grizzly 10% discount coupon was generously provided by a fellow LJ, which helped tremendously with the freight charges. For those who are curious about buying machinery from the US and having it shipped to Canada, I did not have to pay any duties or extra fees—just sales tax. And here’s how it looked unpacked. —Getting the motor lined up was a bit of a PITA, requiring some trial and error to get the motor pulley aligned with the cutter head pulley. Not a huge problem, just takes some time. —The biggest PITA was getting the Cosmoline grease cleaned off the thing, especially out of the cutter head. Q-tips and WD40 are your friend for this job, believe me. —Fit and finish was acceptable for this price point. No peeling paint, overspray, or anything like that. I’ve now run several hundred BF (maybe 1000) of various lumber through the jointer over the last eight months and I can say that I am pleased with the machine’s performance. The 3HP motor has plenty of power for face jointing wide boards, and the spiral cutter head leaves a very good finish on most woods. I do sometimes get minor tear-out on heavily figured soft maple, but it’s easily sanded out. It usually leaves a very smooth finish and leaves the milled surface flat, which is really what it’s all about. The carbide cutters seem to be as sharp now as they were new, and I don’t expect to have to rotate them for a long time. Overall, I would recommend this machine to someone who is looking for a 8” helical head jointer at a moderate price point. I hope this review will prove helpful! Thanks for the Review,enjoy your new jointer. 8” with the helical heads…nice! Thanks for the write up. That looks like an excellent machine. I’m still stuck with my old 6” delta for the time being, but someday I’ll have to upgrade to something similar. Nice review. I have the Delta DJ-20 which is a similar machine. The parallelogram beds are trouble-free, and won’t sag like the dovetail-way style machines. I especially like the long infeed table. You can lay a 6’ long board on the infeed, and it won’t fall off. That long bed sure makes it easy to straighten lengths of lumber. Nice I have one of there 8 inch jointers as well. Been happy with it…. Congrats…..
nwbusa, thanks for the review. But I’m curious about the “missing star.” What would need to be different in order for you to give the tool 5 stars? I just read a review on the Powermatic J882 that was the total opposite of this review on the Grizzly. I recommended the guy return the Powermatic and buy the Griz at half the cost. This review shows exactly why I would suggest such a thing. Powermatic, Delta and the other venerated brands from the past aren’t what they use to be. New owners with new business philosophies have robbed these once great companies of their mystique. Since the new management is looking at ways to cut expenses a decline in quality is inevitable. The buyers need to do the same, save money but do so while looking for an increase in quality. Based on what I see in reviews the up and coming companies are our best bet, they are vying for the market share the big boys have taken for granted and are therefore losing by default. Good review, I’m hoping to upgrade in the future and this info helps make the choice easier. Hi Mark, regarding the 4 star rating—I guess for me, a 5 star rating is reserved for tools that can’t reasonably be improved upon, I.e. near perfect. For this machine, there were some minor fit & finish issues (again, these are very minor) and the whole motor mounting / alignment system is a bit finicky. If I could have given a 4 1/2 star rating, I would have. Overall, it’s a good quality machine that performs well. I bought this same jointer last summer as part of my new retirement workshop. 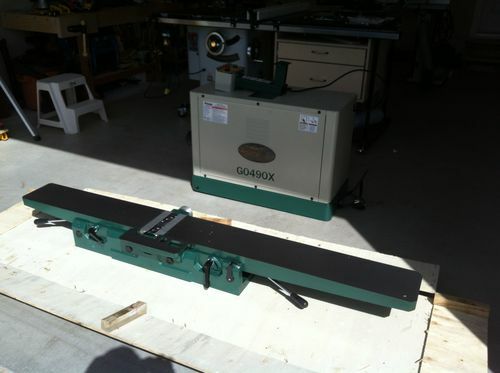 My previous jointer was a Shopsmith…..4” wide and about three feet long. You can imagine how I felt the first time I used an 8” bed over 6 feet long with spiral cutter heads…..the difference between a Yugo and a Mercedes. I didn’t have a problem with the motor alignment, but I agree that the cosmoline is a PITA. 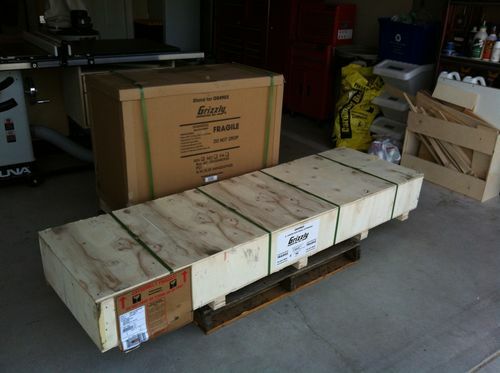 My son and I lifted the bed onto the frame…..then we looked at the spec sheet and found out it weighs almost 400# !! Fired it up and it hums quietly with no vibration. No adjustments necessary, an absolute pleasure to use. Enjoy. Do you have any issues w/ your fence staying at 90 degrees? I bought the same jointer with the straight cutter head (recently switched over to helical, it really is worth the $$$), and I just can’t trust the fence. I check it every time I use it and every time it seems to need a little adjusting. Hi Marcus, what I have learned regarding the fence is that it really needs to have the tightening lever cranked down hard to keep it locked at a given setting. Once I started using the required amount of force to tighten the lever, my fence has reliably stayed at 90 degrees. I still check it periodically. I just got this one myself and have not had time to unpack it due to some work travel. I appreciate your review….I hope my experience mirrors yours. Thanks john. Mine is stuck in storage at the moment, but I’ll pay attention to the locking lever pressure when I get it out.